Orchestras can be very expensive. 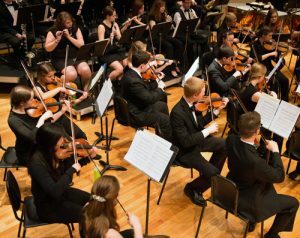 School orchestras and local orchestras don’t always have the budget for everything they need. Which includes travel expenses to concert venues, renting venues, song rights, and even new instruments. Many orchestra fundraisers out there that are very time consuming and costly to start. Giving bean is easy and effective, and exactly what a fundraiser should be. Giving Bean’s coffee fundraiser requires absolutely no start up costs, featuring step by step instructions, fast shipping, and online support. You will earn 40% of the profits from your in person sales and 25% on online orders. Online sales are a great way to reach customers who wish to support your group but don’t live nearby. Assigning each member of the orchestra so sell a certain number of items helps make your fundraising goals seem attainable. It also helps ensure that you will at least meet or surpass your goals. Perfect to do annually or even several times a year,Giving bean can easily fit into your orchestra’s schedule. It’s even easy to set up last minute before an upcoming event. We also offer a ‘show and sell’ option which is a great way to boost sales during a concert intermission or other event. This is 50 assorted items of our most popular flavors of coffee and tea. Request a brochure and get started with your Giving Bean fundraiser today!